Mensa. © 2003 Torsten Bronger. 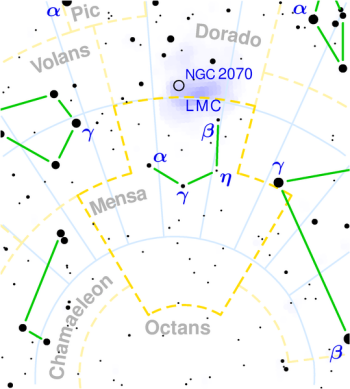 Mensa (abbreviation: Men), the Table, is a small, faint constellation near the south celestial pole. It has few objects of interest for the amateur apart from the Large Magellanic Cloud, part of which overlaps into Mensa from its northern neighbor, Dorado. See below for details of the constellation's brightest stars and interesting deep sky objects.